Happy New Year. And when it comes to shopping in Japan, that means sales and fukubukuro. These "lucky bags" are sold by all kinds of stores, and typically contain products equal in value to what you pay, but sometimes a whole lot more. Even Apple's bricks-and-mortar stores have followed the tradition since 2004, with a handful of bags housing a coveted MacBook Air. 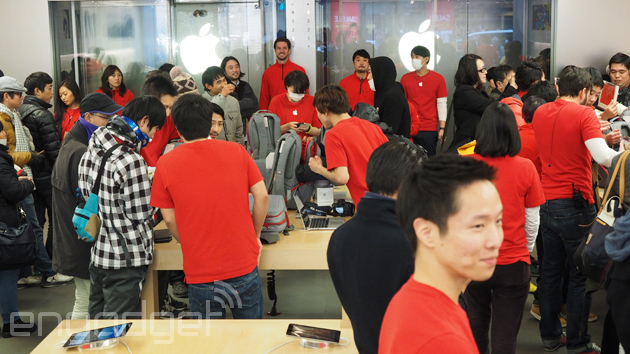 All of the bags cost 35,000 yen, roughly $300, but if you're shopping for an Apple laptop, it's a gamble. There's no guarantee what will be inside yours. 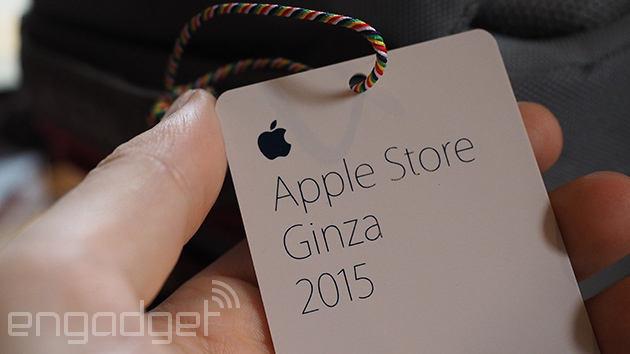 This year, for the first time, Apple has added a handful of limited edition products for its crowd of dedicated Japanese fans. We visited the store in Ginza, Tokyo, today, which alone (there are three stores in the city) managed to attract 900 people before the store even opened. Let's see what 300 bucks can buy, if you're willing to risk it. Lucky bags are a Japanese retail tradition that began at the Matsuya Ginza department store -- which conveniently stands directly across the street from the Apple Store. The first bags apparently went on sale in the late 1800s: Take that Black Friday. 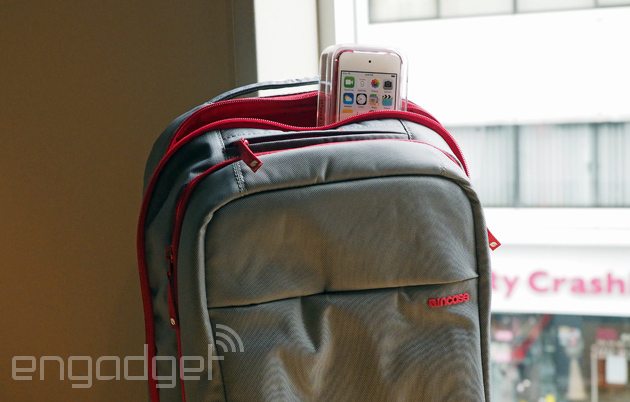 This year, Apple's bags aren't the paper variety, but a limited edition InCase laptop backpack (15,800 yen, roughly $130). Limited edition items also include Mophie Juice Packs, a speaker unit and laptop cases adorned with the same origami print of the lucky backpack. 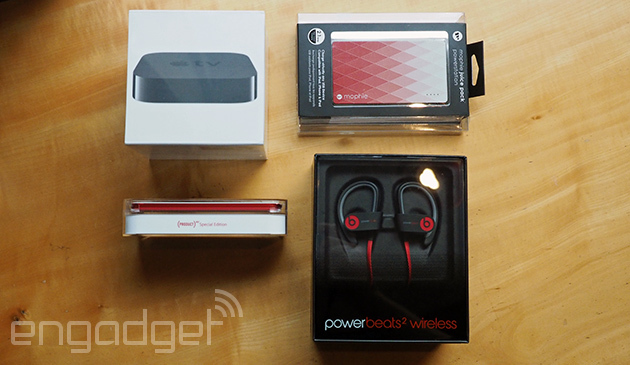 Most bags included the battery pack, as well as a pair of wireless Beats headphones. The rest of the contents, well, vary. If you're not so lucky, you'll find a 16GB Product Red iPod touch. From there it rolls through to the latest iPad mini and iPad Air models. If your bag is particularly lucky (and we saw three), then you could find an 11-inch MacBook Air. That's 88,800 yen worth of luck. (Or around $730.) According to Japanese Apple blog Macotakara, these were the four patterns for the bags. We managed to see second-in-line Yon (a lucky bag regular) get his bag, which housed an 11-inch MacBook Air alongside a cover case and travel adapter. After leaving the store to write up how the madness went down, this editor discovered a friend in the queue. Nothing quite like the emotional roller coaster of a lucky bag, right? So we asked Masa to take us through it all. He was customer number 1,035, according to his entry card, and the line for lucky bags closed almost immediately after him. He was hoping for an iPad mini -- the bag was (kinda tragically) a Christmas present to himself, so we were hoping that his gamble would pay off. After handing over the money (around $300), he was ushered to a table that had the remaining bags on display. The nature of lucky bags ensures the contents are pretty random. The staff doesn't know what's in them, and Apple doesn't offer up a specific number of bags that'll go for sale, or the number of MacBooks hiding within. Did he get his Christmas wish? Let's take a look. No iPad. But such is the life of a lucky bag shopper. However, racking up the retail prices of the contents totals 75,800 yen (around $630 dollars), far in excess of the 35,000 yen paid for it. That said, my friend was... disappointed. The bags offer up a great value, as long as you're happy with the contents. Lucky bags are likely going to remain a Japan-exclusive. (Apple Japan said it doesn't comment on future plans.) Would you take the risk?